Preheat oven to 375. In a large sauté pan, melt butter and add pears, brown sugar, vanilla, and pecans and sauté until soft and starting to brown. Hit it with the lemon zest and turn off heat. Unroll pie crust and smooth over with a rolling pin. Using a round metal cutter or an inverted glass or clean and dry can with lid removed, cut out circles. Reroll leftover dough and cut again using up all the dough. You should be able to get 12 circles (depending on size of can). Repeat with remaining crust giving you 24 circles total which will yield a dozen pies. 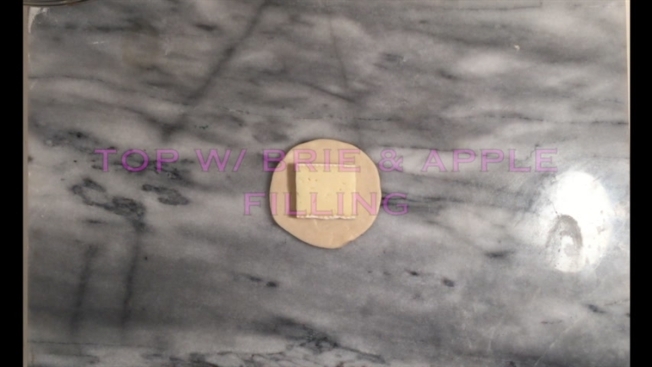 Place 12 circles on a parchment line sheet tray spaced evenly apart. Top each of the circles with a ¼ in thick square of brie to fit your circle leaving at least ¼ to ½ in border. Top with a Tbsp. of filling. Cover with another pastry circle and press down sides. Crimp with a fork to seal. Cut little slits in the tops of the pies. In a small bowl whisk egg with about a Tbsp. of water. Brush egg wash on all pies and sprinkle with coarse sugar. Bake at 375 for 12 minutes or until nice and golden brown. Remove from oven and enjoy warm or cold.